Students and staff of Stonyhurst College witnessed a very special celebration on Thursday 24th January. 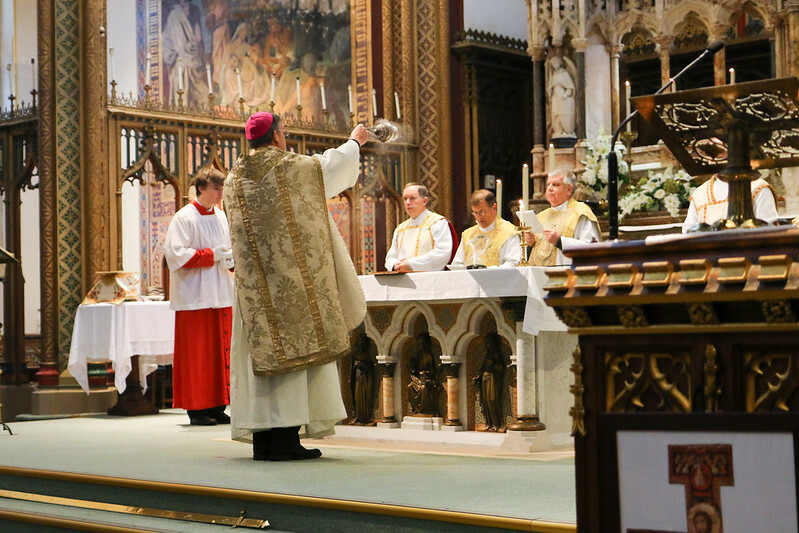 Rt Rev John Arnold, Bishop of Salford, ordained Maximiliano Koch SJ to the diaconate at St Peter’s Stonyhurst. A group from the Colegio Seminario, Uruguay, who were at the boarding school in Lancashire as part of an exchange programme, attended the service. They were accompanied by Pablo Michel SJ and Maria Ines Berasain; and, for the occasion, Fr Marcelo Coppetti SJ, rector of the Colegio, was also present. Maximiliano’s parents arrived from South America as well, while his brother and nephew travelled from Scotland to join the celebration. The Gospel passage for the day told Jesus’ call of the Twelve and His instructions to set off to proclaim repentance. Vocations and service to others were the main focus of the homily. He concluded with renewed congratulations to Maximiliano, and a final remark on the important role faith assumes in decision making and in pursuing our call. The service was accompanied by the Stonyhurst College choir. After Communion, some of the students from the Colegio Seminario united their voices to sing a wonderful Nada te turbe. From the British Province, Fr Provincial Damian Howard SJ, Stonyhurst’s Chaplain Fr Tim Curtis SJ, Fr Andrew Cameron-Mowat SJ, Fr Paul Fletcher SJ, and Fr Michael Ashworth SJ concelebrated at the mass. Sr Bridget Heal, from the Latin-American Chaplaincy at St Ignatius at Stamford Hill, travelled from London for the event. Fr Tim said that he was moved by the way in which everyone, but especially the students engaged with the Mass: "many were touched by Max's parents bringing the vestments to the bishop for him to bless." Maximiliano Koch was born in the north of Argentina. Before joining the Society of Jesus in 2010, he studied Law at the Universidad Nacional de Tucumán and did his doctorate in International Law at the Universidad Pontificia Comillas in Madrid, Spain. As part of this Jesuit formation, he studied philosophy at the Colegio Máximo San José and Theology at the Pontificia Universidad Javeriana in Bogotá, Colombia. Maximiliano, who belongs to the Argentina-Uruguayan Province, is currently in the UK to study an MA in Religious Education at the Institute of Education in London. He is a member of the St Ignatius community at Stamford Hill, north London, and helps out with the parish, particularly with the large local Latin American community. Please, remember him in your prayers.